Soak chana dali in water for one hour. Boil it along with rice in a pressure cooker with 4 cups of water and salt. You may also boil it in a colander, but in that case add salt after boiling excess water (peja) . Then heat ghee in a pan and add cumin seeds, chilies and curry leaves. Put this seasoning on the cooked rice and mix thoroughly. Add lime juice and mix again. 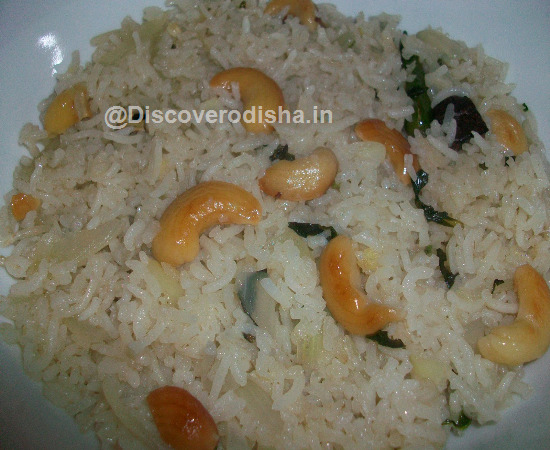 Serve with dalama or any vegetable curry. 2 cups rice 2 table spoon split bengal gram (chana dali / buta dali) 2 table spoon ghee 10 curry leaves (bhursunga patra) 1 teaspoon cumin seeds (jeera) 2 red chilies 2 table spoon lime juice Salt to taste.